Get the information you need about Athletics and Recreation at GeorgianGrizzlies.ca. We are proud to be home to one of Ontario’s strongest varsity programs. We have 13 varsity sports teams which compete across Ontario in the Ontario Colleges Athletic Association (OCAA) with select sports that compete across Canada in the Canadian Collegiate Athletic Association. 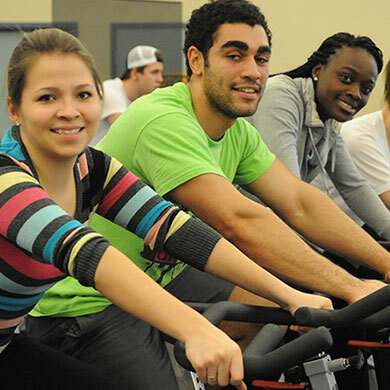 Georgian College students, community members and faculty have access to an impressive array of fitness facilities, programs and services through physical education and athletics. You can access one of our fitness facilities, enjoy one of our many fitness classes each semester, or make an appointment with a personal trainer. Our intramural leagues and clubs offer friendly competition. You won’t want to miss the Halloween Havoc tri-campus dodgeball tournament, March Madness events, Blue Jays and Argos trips, ski nights, campus challenge nights, among others. There’s something for all!